These are the questions that decide who has what it takes to live at South Pole Station, a place with an average temperature of -54°F and no sunlight for six months a year. Cooper Gosling is adrift at thirty, unmoored by a family tragedy and floundering in her career as a painter. So she applies to the National Science Foundation Artists & Writers Program and flees to Antarctica—the bottom of the Earth—where she encounters a group of misfits motivated by desires as ambiguous as her own. There’s Pearl, the cook whose Carrot Mushroom Loaf becomes means toward her Machiavellian ambitions; the oxymoronic Sal (he is an attractive astrophysicist); and Tucker, the only gay black man on the continent who, as station manager, casts a watchful eye on all. The only thing they have in common is the conviction that they don’t belong anywhere else. Enter Frank Pavano—a climatologist with unorthodox beliefs. His presence will rattle this already unbalanced community, bringing Cooper and the Polies to the center of a global controversy and threatening the 800-million-year-old ice chip they call home. In the tradition of And Then We Came to the End and Where’d You Go Bernadette?, South Pole Station is a warmhearted comedy of errors set in the world’s harshest place. 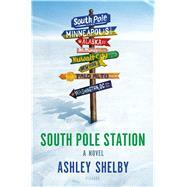 ASHLEY SHELBY is a former editor at Penguin and a prize-winning writer and journalist. She received her MFA from Columbia University and is the author of Red River Rising: The Anatomy of a Flood and the Survival of an American City, a narrative nonfiction account of the record-breaking flood that, in 1997, devastated Grand Rapids, North Dakota. The short story that became the basis for South Pole Station is a winner of the Third Coast Fiction Prize; this is her first novel.